Certain places offer such a splendid harmony of history, architecture and overflowing natural verdure that they seem to invite the siting of art work there. 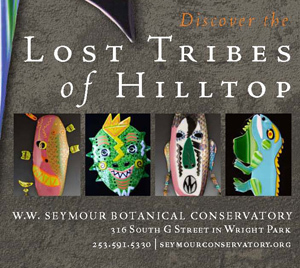 In Tacoma, one of these places is the W.W. Seymour Conservatory, which is presenting the Lost Tribes of Hilltop, an exhibition of glass art by the Hilltop Artists, April 10 through May 24, 2012. The jewel-like dome of the 104-year-old conservatory is set amidst the idyllic landscaping of Wright Park providing a focused and inspired backdrop for the dazzling contemporary glasswork of these skilled student artists. In Lost Tribes of Hilltop, 83 artists aged 12 to 20 take inspiration from the natural world – and a broad imaginative leap – to create glass objects that embody the archaeological relics of a tribe of their own creation. In effect, each of these tribes – including Raven, Wolf, Cheetah, Snake, and Iguana – has created its own mythos, and even a petroglyph illustrating the story of its origin. These vivid works in glass reflect a tribe’s connection to nature, the cultural significance of food, the sacredness of water, and the values shared by all. The non-profit Hilltop Artists program was established in 1994 by Tacoma native and Pilchuck School founder Dale Chihuly, and the late Kathy Kaperick. At the time, Tacoma’s Hilltop neighborhood was beset by high crime and gang activity that impacted the community and its youth. Hilltop Artists offered a diverse group of young people an exciting yet challenging outlet for their promise, drive and talent. Today, the program serves more than 500 students a year, and student art is made available for purchase to the public and private organizations. 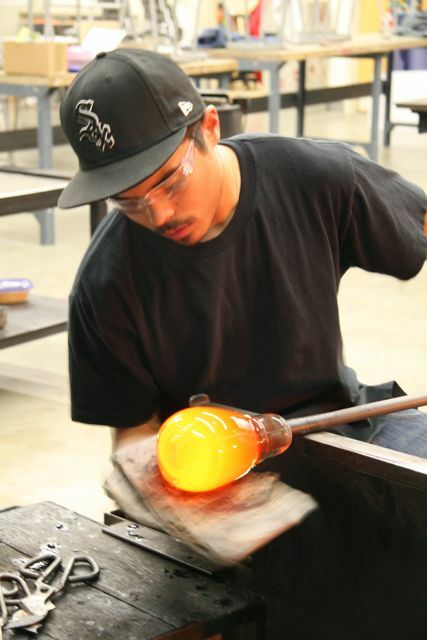 The glassblowing program is tuition-free and all supplies are provided. Please watch this award-winning video by Tyler Kalberg and Adam Pranica to discover the difference Hilltop Artists is making in young lives. Last September, the organization was honored by an invitation to present on their Arts Connect Program at the Clinton Global Initiative (CGI) in New York. Established in 2005 by President Bill Clinton, CGI’s mission is to connect the best minds “to forge solutions to the world’s most pressing challenges.” Congratulations, Hilltop Artists! Nature’s artistry will embrace the glass art produced by human hands in the exhibition at W.W. Seymour Botanical Conservatory, where lush vegetation thrives in the form of ferns, palms, figs, bromeliads, orchids and many other rare, unusual and endangered plants. This historic glass conservatory, with its distinctive twelve-sided central dome, is listed on the National Historic Register. The art works in Lost Tribes of Hilltop will include vibrant examples of blown glass, lampworked beads, fused glass and glass mosaic. The century-old conservatory is constructed with 3,000 panes of glass that make up its dome and wings. What more appropriate setting for the exquisite glass creations of Tacoma’s own amazing, up-and-coming artists? 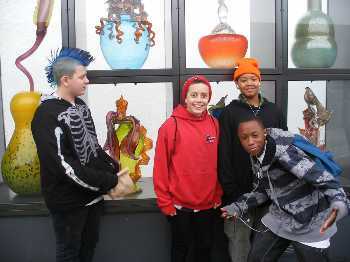 In their element: Hilltop artists on the Chihuly Bridge of Glass. Photo courtesy of Hilltop Artists. WHERE: W.W. Seymour Botanical Conservatory in Wright Park, 316 S. G Street in Tacoma, WA. WHEN: Exhibit opens Tuesday, April 10 and runs through May 24. Special events: Evening Preview at the Conservatory, Friday, April 13, 6-8 pm; admission $25 and RSVP is required. Meet the Artists at the Conservatory, Saturday, April 14, 11 am-2 pm; admission FREE. This event is sponsored by Metro Parks and the W.W. Seymour Conservatory Foundation.